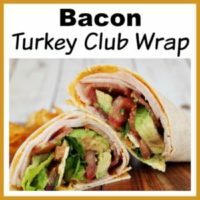 Bacon Turkey Club Wrap- Easy Lunch Recipe with Bacon and Avocado! I’m a big fan of wraps! That’s because I also love sandwiches, but enjoy the lower amount of carbs found in wraps. It doesn’t hurt that they’re also quick to make! 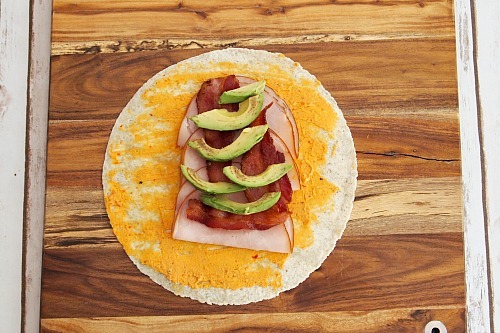 This wrap recipe is easy, but so delicious, courtesy of bacon and avocado. The next time you need an idea for a simple lunch to make, you have to make this Bacon Turkey Club Wrap! If your family is gluten-free, its easy to use gluten free wraps in this recipe instead of traditional ones! And while I used a white flour wrap this time, I’ve also enjoyed wraps made with spinach, and even whole wheat/multi-grain wraps! 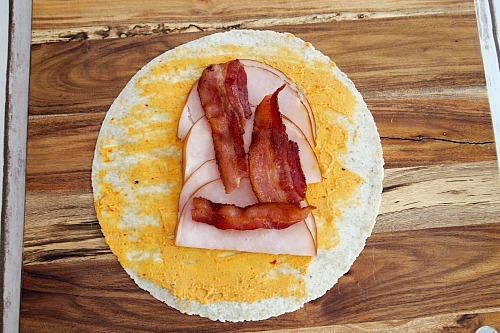 Do know that the wrap is an integral part of this bacon turkey club wrap. Use a good wrap and you’ll wish lunch could never end! But use a bad one, and your delicious meal will be ruined by the flavorless cardboard texture of a bad wrap. 1. Cook your bacon. You only need 3 strips, but I went ahead and cooked the whole package of bacon and put the extras in the fridge to use throughout the week. I kept the bacon fat in a stainless steel grease can to use later. 2. Lay out your wrap. Spread a generous amount of hummus over it. 3. Place your 3 slices of turkey. I folded up each slice in half and arranged them in a row to keep the amount of meat even across the wrap. Top the turkey with your bacon strips. 4. Slice your half of an avocado and put the slices on top of the bacon. 5. Slice your half of a tomato and put the slices on top of the avocado. 6. Chop up your lettuce leaf and distribute it on top of the tomato. 7. If you used nitrate-free meat like me, you’ll probably want to add a couple shakes of Italian seasoning, onion powder, and garlic powder. That’s because one of the unfortunate side effects of not having harmful nitrates in your meat is slightly less default flavor. The spices are a natural way to help bring the delicious turkey and bacon flavors back out! 8. Finally, roll up your wrap. Slice it in half, then serve! 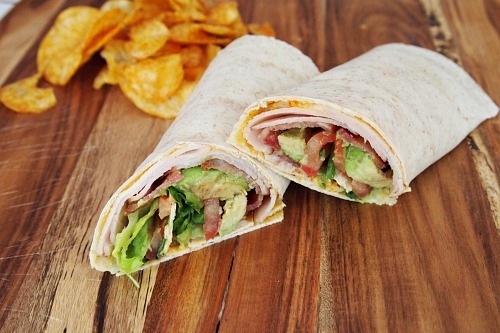 Pair this yummy bacon turkey club wrap with chips and fruit cups and lunch is ready! Or you could even serve this as a quick dinner for busy nights! Wraps are like healthier versions of sandwiches, and make easy lunches! 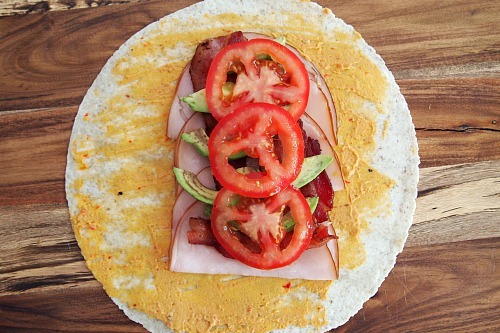 Here’s how to make a delicious bacon turkey club wrap with avocado! Cook your bacon. You only need 3 strips, but I went ahead and cooked the whole package of bacon and put the extras in the fridge to use throughout the week. I kept the bacon fat in a stainless steel grease can to use later. Lay out your wrap. 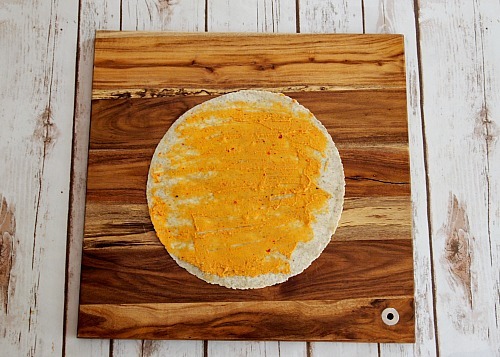 Spread a generous amount of hummus over it. Place your 3 slices of turkey. I folded up each slice in half and arranged them in a row to keep the amount of meat even across the wrap. Top the turkey with your bacon strips. Slice your half of an avocado and put the slices on top of the bacon. Slice your half of a tomato and put the slices on top of the avocado. Chop up your lettuce leaf and distribute it on top of the tomato. If you used nitrate-free meat like me, you’ll probably want to add a couple shakes of Italian seasoning, onion powder, and garlic powder. That’s because one of the unfortunate side effects of not having harmful nitrates in your meat is slightly less default flavor. The spices are a natural way to help bring the delicious turkey and bacon flavors back out! 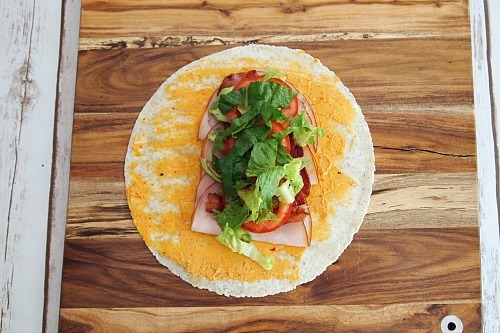 Finally, roll up your wrap. Slice it in half, then serve! 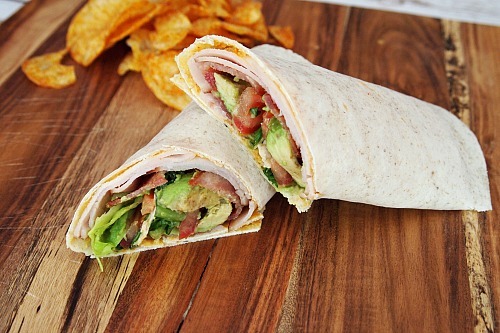 Do you often make wraps for lunch? 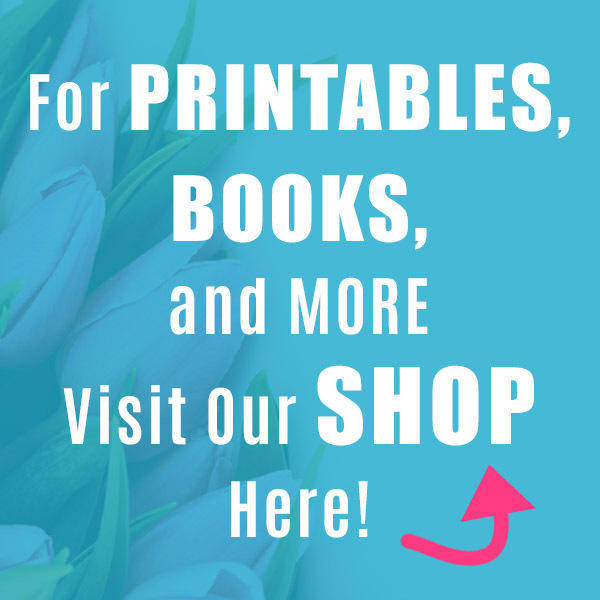 This post contains referral links to Amazon. 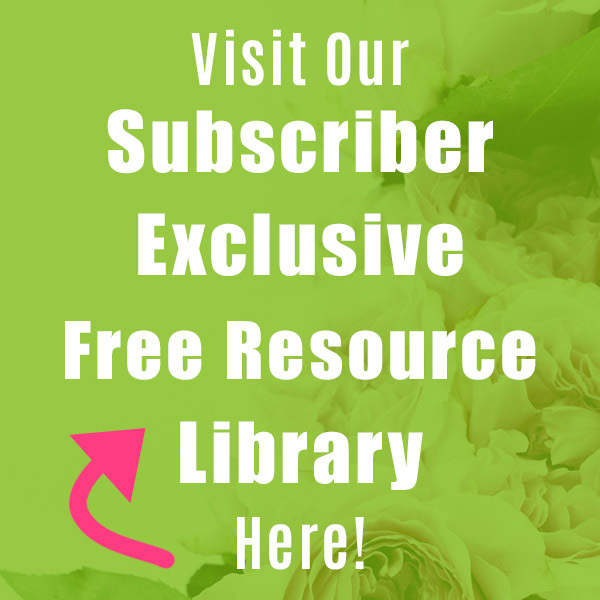 Please see our Disclosure Page for more information, and thanks for supporting this site! Ahh…I like the idea of using hummus instead of cream cheese. I don’t know why I didn’t think of that since my youngest loves hummus. 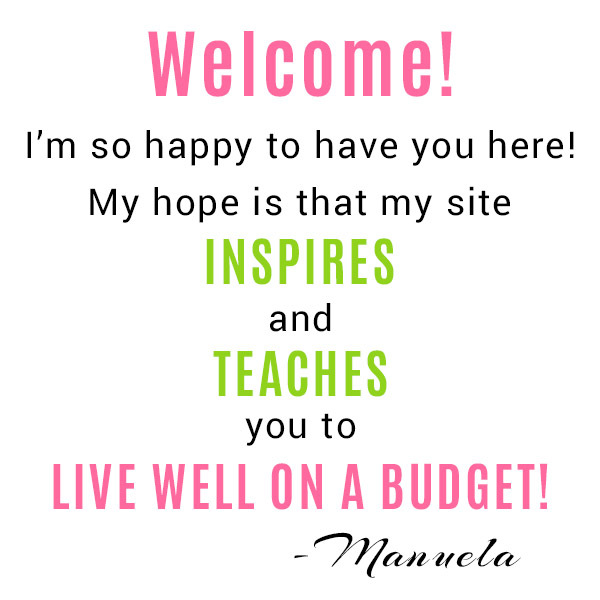 Thanks for sharing this on Merry Monday. Pinned. This was my favorite from last week’s Delicious Dishes Recipe Party! 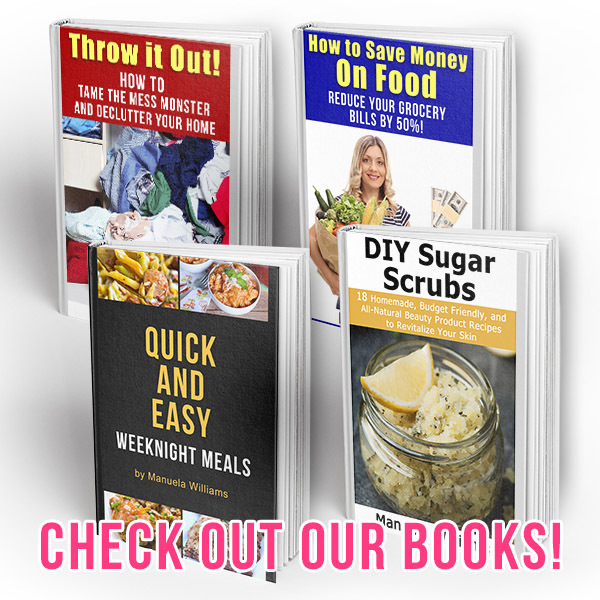 It’s featured today and will be pinned to our group board plus I’m going to find a few other recipes of yours to pin to my personal boards. Enjoy!